This week’s edition of Antelope Intros features an intake/administrative specialist who is proof that one animal’s paws offer loving support. The other is a University counselor with a passion for serving others. 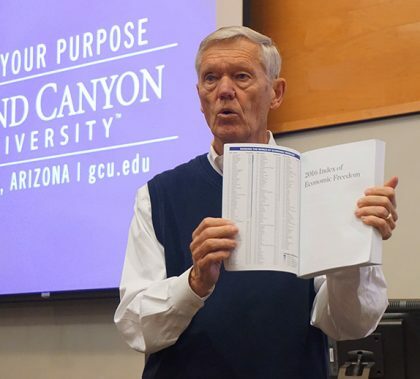 World-renowned economist Dr. Barry Asmus spoke to Tim Kelley’s “Introduction to Economics” class at Grand Canyon University’s Colangelo College of Business on Wednesday morning. Asmus will teach an upper-level economics class at GCU beginning in fall 2017. GCU curriculum designer Ruth Douthitt has a head — and heart — filled with stories and a hobby as a published book author. To celebrate the publication of “The Children of Manor House,” the third in her “The Children Under the Ice” ghost-detective book series, she will sign books at a party 4:30 p.m. Friday at Canyon 49 Grill. Photos by Slaven Gujic GCU News Bureau Employees and local dignitaries gathered Wednesday afternoon for the official grand opening of the new office complex at 27th Avenue and Camelback Road. 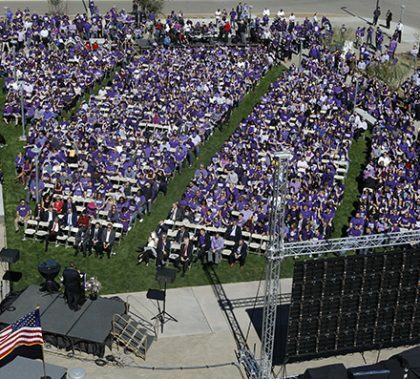 The event had all the purple-tinted GCU trimmings, including appearances by the Thundering Heard Pep Band, the cheer and dance teams, and Thunder. A beautiful day, a perfect setting — it wasn’t that long ago that those words would have seemed incongruous with the parcel of land at 27th Avenue and Camelback Road. But GCU has turned it into a thriving business hub, and on Wednesday that was worth celebrating with appearances by local politicians and other dignitaries. 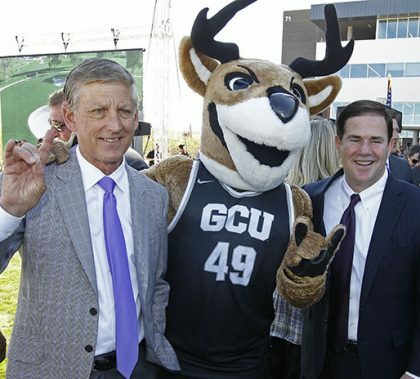 They had high praise for what GCU has accomplished. Moving from their old offices in north Phoenix and Tempe to the new location at 27th Avenue and Camelback Road has been an exciting change, according to employees. 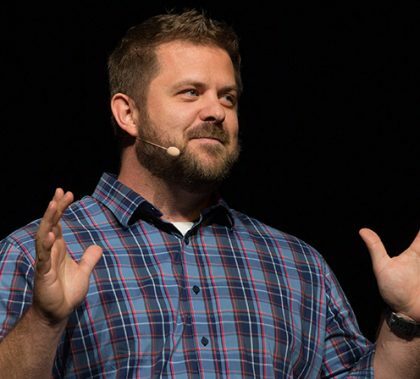 “I love being on campus because I feel the energy, feel the dynamics of what GCU is all about,” said Mark Cruise, an adviser in the College of Doctoral Studies. 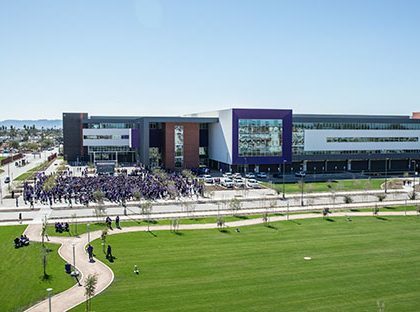 GCU has replaced a run-down hotel, adult shop, used car lot and swap mart with a newly opened 325,000-square-foot office complex, renovated hotel, new restaurant and a business/ economic/education innovation center. While it’s romantic to think that love is all about that first crush and the rush of your pulse, a healthy relationship is more about self love and learning to set strong boundaries. 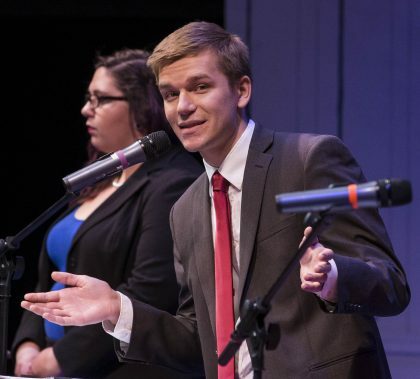 “First of all, you have to learn about yourself and knowing your emotions,” said Dr. Elizabeth Valenti, a psychology instructor in GCU’s College of Humanities and Social Sciences. Her session on “Tools for a Healthy Relationship” is part of Mental Health Week.